"Mevlevi" redirects here. For other uses, see Mevlevi (disambiguation). Hodjapasha Culture Center is a restored Ottoman hamam (Turkish bath) in Istanbul's Sirkeci district now used for performances of the Mevlevi (whirling dervish) sema. The Mawlaw'īyya / Mevlevi Order (Turkish: Mevlevilik or Mevleviyye Persian: طریقت مولویه‎) is a Sufi order in Konya (modern day Turkey) (capital of the Anatolian Seljuk Sultanate) founded by the followers of Jalal ad-Din Muhammad Balkhi-Rumi, a 13th-century Persian poet, Islamic theologian and Sufi mystic. The Mevlevi are also known as the Whirling Dervishes due to their famous practice of whirling as a form of dhikr (remembrance of God). Dervish is a common term for an initiate of the Sufi path; the whirling is part of the formal Sama ceremony and the participants are properly known as semazen-s. In 2008, UNESCO confirmed "The Mevlevi Sema Ceremony" as amongst the Masterpieces of the Oral and Intangible Heritage of Humanity. Model of a dervish studying. The Mevlevi order was founded in 1273 by Rumi's followers after his death, particularly by his successor Hüsamettin Çelebi who decided to build a mausoleum for their master, and then their master's son, Baha al-Din Muhammad-i Walad (or Çelebi, Chelebi, meaning "fully initiated"). He was an accomplished Sufi mystic with great organizing talents. His personal efforts were continued by his successor Ulu Arif Çelebi. The Mevlevi believe in performing their dhikr in the form of a "dance" and musical ceremony known as the Sama, which involves the whirling, from which the order acquired its nickname. The Sama represents a mystical journey of man's spiritual ascent through mind and love to the "Perfect". Turning towards the truth, the follower grows hey through love, deserts his ego, finds the truth, and arrives at the "Perfect". He then returns from this spiritual journey as a man who has reached maturity and a greater perfection, able to love and to be of service to the whole of creation. of this world and the other. The origin of Sama is credited to Rumi, Sufi master and in whose name the Mevlevi Order was founded. The story of the creation of this unique form of dhikr tells that Rumi was walking through the town marketplace one day, when he heard the rhythmic hammering of the goldbeaters. It is believed that Rumi heard the dhikr, "la elaha ella'llah" in Arabic "لا اله الا الله", or in English, "There is no god but Allah (The God)", spoken by the apprentices beating the gold, and was so filled with happiness that he stretched out both of his arms and started spinning in a circle. With that, the practice of Sama and the dervishes of the Mevlevi Order were born. The Sama was practised in the samahane (ritual hall) according to a precisely prescribed symbolic ritual with the dervishes whirling in a circle around their sheikh, who is the only one whirling around his axis. The Sama is performed by spinning on the Left foot. The dervishes wear a white gown (tennure) (symbol of death), a wide black cloak (hırka) (symbol of the grave) and a tall brown hat (kûlah or sikke), symbol of the tombstone. Sama ceremonies are broken up into four parts which all have their own meanings. Naat and Taksim – Naat is the beginning of the ceremony where a solo singer offers praise for the Islamic prophet Muhammad. The first part is finished with taksim (improvisation in free rhythm) of the ney reed flute which symbolises our separation from God. Devr-i Veled – During the following Devr-i Veled, the dervishes bow to each other and make a stately procession in single file around the hall. The bow is said to represent the acknowledgement of the Divine breath which has been breathed into all of us. After all the dervishes have done this they kneel and remove their black cloaks. The Four Salams – The Four Salams are the central part of Sama. The samazens or whirling dervishes are representative of the moon and they spin on the outside (sufi whirling) of the Sheikh who is representative of the sun. They, as previously mentioned, spin on their left foot and additionally, they have their right palm facing upwards towards Heaven and their left hand pointing at the ground. The four salams themselves are representative of the spiritual journey that every believer goes through. The first one is representative of recognition of God, the second one is recognition of the existence in his unity, the third one represents the ecstasy one experiences with total surrender and the fourth one, where the Sheikh joins in the dance, is symbolic of peace of the heart due to Divine unity. After the four salams, this part of the ceremony is concluded with another solo Taksim. Concluding Prayer – The fourth part of the ceremony is a recitation from the Qu'ran and a prayer by the Sheikh and then the Sama is complete. The Mevlevi became a well-established Sufi order in the Ottoman Empire by realising a blood relationship with the Ottoman sultans when Devlet Hatun, a descendant of Sultan Veled married the sultan Bayezid I. Their son Mehmed I Çelebi became the next sultan, endowing the order, as did his successors, with many gifts. Many of the members of the order served in various official positions of the Caliphate. The centre for the Mevlevi order was in Konya, where their 13th century guiding spirit, Jelaleddin al-Rumi is buried. There is also a Mevlevi monastery or dergah in Istanbul, in the Beyoğlu district, where the sama is performed and accessible to the public. During the Ottoman Empire era, the Mevlevi order produced a number of famous poets and musicians such as Sheikh Ghalib, İsmail Ankaravi (both buried at the Galata Mevlevihanesi and Abdullah Sarı. Vocal and instrumental music, especially the ney, plays an important role in the Mevlevi ceremony and famous composers such as Dede Efendi wrote music for the ayin (cycle of Mevlevi ceremonial music). The ayin text is normally a selection from the poetry of Rumi. If one buys a CD of Turkish Sufi music, chances are it will be a Mevlevi ayin. During the Ottoman period, the Mevlevi order spread into the Balkans, Syria, Lebanon, Egypt and Palestine, especially in Jerusalem. The Bosnian writer Meša Selimović wrote the book "The Dervish and Death" about a Mevlevi dergah in Sarajevo. The Mevlevi Order has some similarities to other Dervish orders such as the Qadiri (founded in 1165), the Rifa'i (founded in 1182), and the Kalenderis. During World War I, the Mevlevi Regiment served in Syria and Palestine under the command of 4th Army. A battalion of some 800 dervishes was formed December 1914 in Konya (the Mucahidin-i Mevleviyye) and was sent to Damascus. Another battalion of regular recruits was added at the end of August 1916, and together they formed the Mevlevi Regiment. This unit did not fight until the end of the Palestine campaign and was disbanded at the end of September 1918. Mustafa Kemal met with members of the Mevlevi Order in 1923 before its institutional expression became illegal. 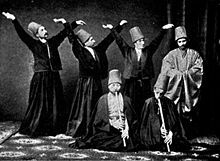 It is believed that since 1925, Rumi's descendants still practiced their unique form of dancing zikr, called "sama" by the Mevlevi. In 1953, the Mevlevi were given partial rights to perform sama in public but primarily because it was important as a tourist attraction for Turkey, but as a Sufi order they are currently still banned. In 1971, they performed in London with Kâni Karaca as lead singer. In 1972, they toured North America for the first time with Kâni Karaca, Ulvi Erguner, and Akagündüz Kutbay among the musicians. They performed in France, for Pope Paul VI, and at the Brooklyn Academy of Music and other venues in the United States and Canada - under the direction of the late Mevlevi Shaikh Suleyman Hayati Dede. In 2007, 2012, and 2015 the order initiated tours of the U.S. where they performed to sold-out crowds in places such as Denver, San Francisco, Portland, and Seattle. The order is still active in Turkey, currently led by the 20th great-grandson (22nd generation descendant) of Rumî, Faruk Hemdem Çelebi. Tourists can attend ceremonies in Istanbul and Konya. ^ "The Mevlevi Sema Ceremony". UNESCO. Archived from the original on April 26, 2014. Retrieved 8 May 2014. ^ Sheikh Abdul Azziz (1 Apr 2014). "Sufism Journal: Sufi History: Schools of Sufism: Rumi and the Whirling Dervishes". Sufism Journal and the International Association of Sufism. Retrieved 8 May 2014. ^ "Mevlevi - LookLex Encyclopaedia". Looklex. Retrieved 8 May 2014. ^ "Mevlevi Australia". Mevlevi Australia. Retrieved 8 May 2014. ^ Mevlana Celaleddin Rumi. "Mevlana Celaleddin Rumi - The Whirling Dervishes, Sema". The Rumi Family. Retrieved 8 May 2014. ^ Yavuz Özedmir (2013-11-18). "T.C. Galata Mevlevihanesi Müzesi Resmi Web Sitesi". Galata Mevlevihanesi Müzesi Müdürlüğü. Retrieved 8 May 2014. ^ "About the Mevlevi Order". International Mevlana Foundation. Retrieved 8 May 2014. ^ Koentges, Chris. "13 Things The Whirling Dervishes Can Teach You About Spinning". The Very Ethnic Project. Wikimedia Commons has media related to Dervishes. This page was last edited on 17 February 2019, at 13:09 (UTC).